GSD Rescue --- Rescue a dog and get a devoted friend for life! IF YOU'RE THINKING ABOUT ADOPTING A GERMAN SHEPHERD DOG. There may be no breed of dog more versatile than the German Shepherd Dog (GSD). This muscular, agile, intelligent dog shines in many areas beyond herding - flashy show dog, watchful guardian, relentless police adjunct, effective search and rescue tracker, trusted guide and loyal family companion. To some, the Shepherd is the ideal dog, but is it the right breed for you? Click on the link above for the full article. In bringing a German Shepherd into your home, you are making an addition to your family and he will quickly feel a part of it. Your house, your garden, your possessions and in fact all that you own will from then on be in his special care. He needs your love, but he also needs correct attention to his grooming, exercise, food, and generalwelfare. Once given these, your German Shepherd will devote his very life to you. Your life will be richer for this as well as for the companionship and love you both will share. Myth 2: It's better to get a puppy. With an older dog, you never know what you're getting. Myth 3: If you train your dog right, he'll stay in the yard without a fence. Myth 8: My 8 month old German Shepherd is biting people. He's not lunging or growling, but he makes little nips on arms and legs. I can't keep an aggressive dog. Myth 9: I'm unsure about getting a rescue dog, because I'm afraid he won't bond to me. You know that cute Kodak commercial with the puppies climbing all over the giggling little boy? Have you ever noticed how short it is? That's because they could only film for a few seconds before the welts rose, the blood dripped, and the boy began to scream for his mother. Puppies have needle-teeth that they happily sink into anyone who walks by. They also have sharp nails that scratch when they jump up -- and on little Ryan, those front feet land right around his face. Puppies leave "presents" that your toddler always seems to find before you do. Puppies wake your children during the night. And a puppy doesn't know the difference between his stuffed toy and Sarah's Piglet that she MUST have to fall asleep. And suppose you get a puppy when little Morgan is 2. In six months, Morgan will be about 1 inch taller and 3 pounds heavier. However, the eight month old puppy will now be as tall as Morgan and outweigh her by 30 pounds. And those baby teeth will have been replaced by big snappers that need to chew. Seems to make sense, except the exact opposite is true. All puppies are cute; all puppies love everyone. It's not until a dog hits sexual maturity that some innate behavioral problems start to surface. We can't even estimate how many calls we've had from people who paid thousands of dollars for a purebred puppy, who is now a year or two old and biting people, attacking other dogs, or engaging in some oddball neurotic behavior. Purebred is not the same as well-bred, and sometimes it feels like the disreputable breeders grossly outnumber the responsible ones. The truth is this: when we list a 4 month old puppy, we can only guess what kind of adult she'll make. When we list an 18 month old dog, we can predict pretty accurately what kind of dog you'll have forever. Many people believe this, right up until the moment the dog is hit by a car, eats poison in the neighbor's garage, or is stolen. We insist on a fence or leash walks. Rescue dogs are typically either strays (which means they have a history of wandering) or owner-surrenders (which means they're going to go look for their ex-owner first chance they get). We just can't risk it. No, you didn't. Trust me, he was only perfect because you were 8 and didn't have to clean up after him and be responsible for him. I know you believed he was perfect, but you also believed in Santa and honest government then, too. Since I've been an adult, I've never had a perfect German Shepherd--but every single one of them was perfect for me! BUUUUZZZZZ! I'm sorry. Try 2 or 3. Many shepherds don't calm down and hit their stride until they're 4 or 5. And you know that wonderful mental image you have of the stoic and noble shepherd sitting on the hill surveying his domain? He's 9! In the wacky world of GSDs, that's just not true. For starts, it's impossible to make gender-based absolutes. But once you spend time around GSDs, you'll start to notice there are plenty of hyper, dominant females out there. You'll also notice lots of mellow, roll-with-the-punches males (especially after they make that all-important trip to Dr. Knife). It all depends on the individual dog, but don't think for a minute that a female is a sure ticket to a passive, submissive pooch. People who don't like white shepherds are often, coincidentally, the same people who have never spent any time around them. While the AKC does not YET recognize the whites, most other registration organizations, like the UKC, do! Many die-hard black and tan'ers have had their minds changed by the fabulous whites that have come through MAGSR. And if you still don't believe me, check out our Success Stories page. For more information on the MANY GSD colors go here. The secret here is to look at the last 4 letters in the breed name: herd. 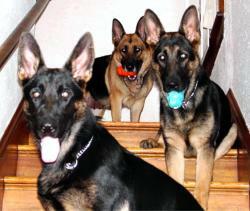 German Shepherds herd. It's what they do. And chances are, that's all he's doing to your friends and family. This is called this mouthing. It's what happens when those cute little puppy bites go uncorrected. And if your dog's doing it, he will continue to do it--and do it harder and stronger--until you DO correct it. Fortunately, it is relatively easy to fix in most dogs. There's lots of tips on the internet (just search for "dog mouthing") and your vet can probably help as well. If the problem is really out of hand, you may need to call in a trainer for a few sessions. Look at it from the dog's perspective. He's spent the bulk of the last year on a 6 foot chain in someone's back yard because he committed the unconscionable sin of no longer being a puppy. At some point during the day, someone may remember to bring him food and water. The only attention he gets is when they yell at him for barking - or worse. Finally, they take him for a car-ride--dumping him in a wooded area where he can have a "fighting chance." Despite everything, he waits there for their return or tries to get back home. He finds water somewhere. He raids trash cans and gets sick. If he's extremely lucky, he survives long enough for an animal lover to find him and bring him to the shelter. You not only bring him into your house, you give him his own bed and bowl, and maybe a crate where he feels safe. You speak quietly to him. When he messes on the carpet, you don't seem to mind--you just take him outside and then clean it up. You feed him regularly AND give him toys and treats and nylabones. He sleeps in your room. He may even have a big brother or sister to play with. He gets kisses and hugs all the time for "no reason". And when he goes out in the car, he always comes back. Your rescue dog's biggest fear is that you will spontaneously combust. GSDs are particularly sensitive about the connections with their people so once they have the attention they so desperately crave and need, they do whatever they can to ensure they never, ever lose it. He's not going to let you out of his sight for one minute. People with rescue dogs learn to function with a 70 pound shadow following us everywhere. Article by Betsy Morris of MAGSR. Good reasons to choose a rescued dog. Unfortunately, many folks think dogs that end up in rescue are all genetically and behaviorally inferior. But, it is not uncommon for Rescue to get $500 dogs that have either outlived their usefulness or their novelty with impulsive owners who considered their dog a possession rather than a friend or member of the family; or simply did not really consider the time, effort and expense needed to be a dog owner. Not all breeders will accept "returns", so choices for giving up dogs can be limited to animal welfare organizations, such as rescues, or the owners trying to place their own dogs. Good rescues will evaluate the dog before accepting him/her (medically and behaviorally), rehabilitate if necessary, and adopt the animal only when he/she is ready and to a home that matches and is realistic about the commitment necessary to provide the dog with the best home possible. Written by Mary Clark at Labrador Retriever Rescue Inc.
To show me that I deserve love, just because I exist. You saved me from the terror of the pound, Soothing away memories of my old life. You have taught me what it means to be loved. I have seen you do the same for other dogs like me. I have heard you ask yourself, in times of despair, why you do it. Make just a little more room... to save one more like me. We would die if not for you! None of them can get past my age. "Way past his time, he can't run and play." I got in their way, something was wrong. I saw your face, and felt there was hope. And knew I had life beyond this cage. But you've given me a love so much stronger. Hasn't eaten since God knows when. Hungry but clean, to our dismay. When she got up, I saw she was crippled. There's the poor doggy standing in the rain. I've tried to entice him time and again. He's coming now, so I'll open the door. Or caged in shelters- nobody takes home. Make room for another in your home and heart. German Shepherd Dog Rescue Houston, Inc.
Golden State German Shepherd Rescue is a 501(c)(3) nonprofit charitable organization. We are a small group of volunteers and have no paid staff, facility, office or kennel. Our volunteers are located mainly in the San Francisco Bay Area. Our mission is to help German Shepherd Dogs in life threatening situations, and to educate the public about this highly intelligent and versatile breed. Most of the German Shepherd Dogs we rescue come from the Northern and Central Valley regions of California. North Star German Shepherd Dog Rescue, Inc.
TOP TEN REASONS TO ADOPT AN OLDER DOG! !